Innovative partnerships, where businesses can work with and leverage the assets of governments, NGOs, and civil society, can help develop creative, sustainable, and scalable solutions that can create significant impact. 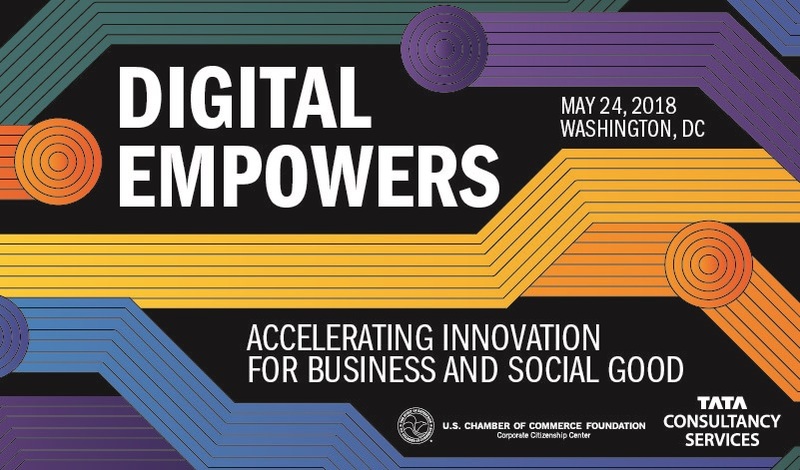 The partnerships and the technologies that make this possible is the focus of Digital Empowers: Accelerating Innovation for Business and Social Good, a forum hosted by the U.S. Chamber of Commerce Foundation and Tata Consultancy Services. Convene with business leaders, technical experts, and on-the-ground partners that are shaping the future of innovation and social impact. Hear from other participants how their organizations leverage new technologies and digital innovations, including blockchain, design thinking, virtual reality, robotics, data collaboratives, and cloud analytics to increase access and equity to individuals and communities. Gain an exclusive opportunity to engage with speakers and thought leaders to learn more about technical elements related to emerging technologies, best practices for cross-sector partnerships, and what shared value means in action. Join us on May 24 in Washington, D.C. and discover the possibilities that exist when we apply the power of technology for social good. Learn more and register here today. Congrats to the Best Corporate Steward – Large Business Finalists! Congrats to the 2017 Best Corporate Steward – Small & Middle Market Business Finalists! Congratulations to the 2017 Best Commitment to Education Program Finalists!